Looking for the great spot to raise the kids? Here it is...Situated in Parkers Point, a private well kept community, this home has been meticulously maintained in and out. From the time you enter the entry foyer to when you make your way out back to the extra large deck you will like what you see! Nice sized master bed and bath on the 1st floor featuring a tiled shower, large tub and dual vanity. Extra bonus room could easily be a 4th bedroom or game room. Plenty of space in the back yard for the kids to play while you BBQ on the back deck with friends or family. Gas fireplace in the formal living room and dual zoned heat pumps with HVAC installed in attic area. Kitchen with breakfast area overlooking your tree buffered back yard. 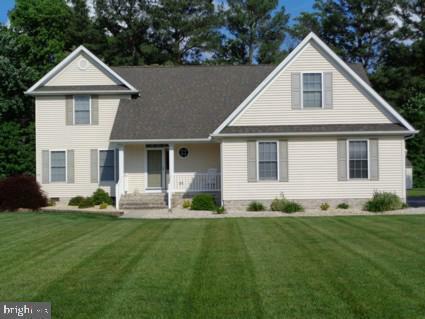 Quiet country setting only minutes to all services offered in Millsboro.